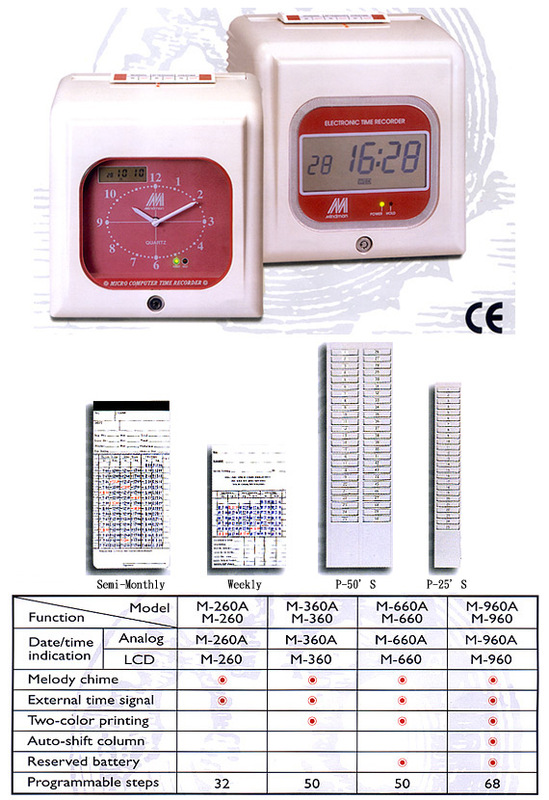 Electronic Time Recorder - Way Fu Industrial Co., Ltd.
We are a reputed of quality electronic time recorder. Our devoted clients have counted on us to help them with their time recording problems and needs. We would use years of experiences to manufacture the best model for you. No matter you are a company with thousands of employees or a one with less than 50 employees, you can trust us by keeping a accurate record for you. Electronic time recorder developed by Way Fu Industrial Co., Ltd. includes: perpetual calendar, 3-year memory protection, auto time adjustment, selectable print formats. With constant innovation and development, Way Fu is always improving our timer systems. Our mechanical products has been approved by CE in 1998 and 2000. In 2002, we also acquired UL approval, ensuring the quality for our global clients. With nearly 30 years of OEM / ODM manufacturing experience, we are sure that our electronic time recorder series can serve as the premium time tracking solution. Established in 1980, we have built up our reputation through brand names of Mindman and Kings Power in the global time clock market. The products are suitable for factory, retail store, or office applications. The major markets of our electronic time recorders include Asia, Europe, North America, Middle/South America, and Africa. We welcome any inquiries about our products and hope to become our clients’ best choice for time recording solution. Please send your inquiry today for detailed information. Compact sized mechanical time recorder with full functions. Superior reliability in the Electronic Time Recorder. Perpetual calendar, automatic adjustment at the end of the month and leap year. 6-column printing with automatic control of the column position for printing arrival and departure time. Simple, easy-to-understand operation, with a maximum of 68 programmable steps. Automatic compensation for the printer during recovery from power failure. Back-up battery keeps working for 36 hours after power failure. 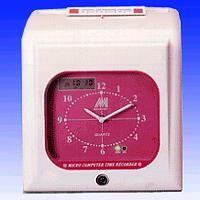 Daylight savings time(Summer time)function for the Electronic Time Recorder. Vertical printing mode with 6 columns per week. Payroll cut-off date seeting can be changed at option. Memory protection up to 3 years, requires no programing operation after power resumption. All series with CE marking, conform to EMC and LV directive.